Kia Optima Sportswagon Running Costs, MPG, Economy, Reliability, Safety | What Car? As is usual with Kia models, the Sportswagon comes with lots of standard equipment. Even the entry-level 2 model has plenty of luxuries, such as climate control, cruise control, power-folding door mirrors, 17in alloy wheels and a leather-trimmed steering wheel and gear knob. As a consequence, we’d stick with that to make the most of the Sportwagon’s competitive list price, although 3 trim is still worth considering if you like your toys. Anyone who pays for their own fuel will appreciate the Sportwagon’s impressive claimed combined fuel consumption of up to 61.4mpg. Company car drivers will face fairly palatable monthly tax bills, with CO2 emissions from 121g/km for the diesel engine, but that’s still beaten by the Superb 2.0 TDI 150’s 113g/km and the Mondeo 2.0 TDCi’s 112g/km. Although we’re yet to drive it, it’s unlikely that the 241bhp 2.0-litre petrol will prove highly recommendable. It’s available only in the pricey GT trim and halves fuel economy to 30.7mpg, nearly doubling CO2 emissions to 211g/km. If you want a petrol, we’d steer you towards more economical options offered in rivals, such as the Superb 1.4 TSI 150. 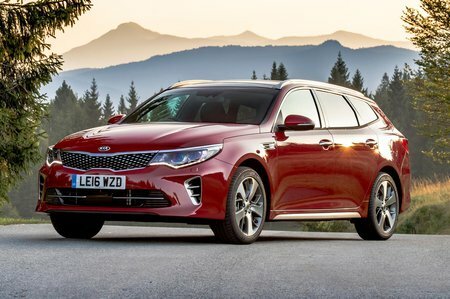 Euro NCAP awarded the Optima (it hasn’t tested the Sportswagon specifically) a five-star safety rating. However, it’s disappointing that preventative safety features are reserved for the more expensive trims; you have to step up to GT-Line S to get automatic emergency braking, and you can’t add it as an option on cheaper versions. The entry-level 2 trim also misses out on lane-keeping assistance, speed limit information and driver attention monitoring. Kia finished a very impressive fourth place in our latest Reliability Survey, and the firm’s excellent standard seven-year/100,000-mile warranty is on hand should anything go wrong, whereas most rivals offer only three years.